Coffee, like life, is meant to be enjoyed. Like a lazy Sunday morning at the beach, Gusto is all about taking a break, and enjoying life. Featuring the smooth, sweet flavours of the best Latin American coffees, Gusto is an espresso that is effortless to enjoy. 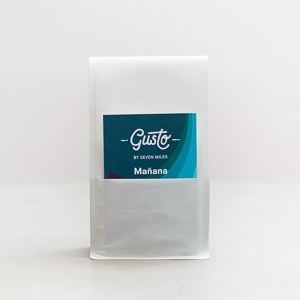 The Mañana blend features coffee from the Finca La Encanada estate in Peru, who we have been working with directly for over 7 years. This coffee brings a rich, caramel sweetness, which combines beautifully with the Brazil pulp-natural coffee to deliver a full body with notes of spice and cocoa. These coffees are complimented by a selection of high-grown Latin coffees from Colombia, Guatemala & Costa Rica resulting in a balanced, delicious espresso blend.